Cold weather doesn't cause illness but can play a role in contracting a cold or flu virus. The real causes of illness involve staying inside and close contact with infected people. Running in the winter can keep your immune system strong, but hypothermia and dry air can leave you susceptible to infection. If you take the proper precautions, running in the cold won't give you the sniffles. Bacteria and viruses that cause illness are spread through contact. Germs can survive for days on doorknobs or light switches, and can travel through the air via sneezes and coughs. Once a pathogen reaches a mucus membrane in your body, like the lining in your nose, the germ has a higher chance of replicating and starting an infection. Hibernating in a germ-free area throughout winter is the only way to truly eliminate your chances of infection. Since you likely have to work and take care of a family, limiting your exposure to germs, maintaining your immune system and washing your hands frequently are better options for preventing infection. Cold weather actually might activate your immune system, increasing your norepinephrine, a hormone that works as a natural decongestant. However, some aspects of the winter season might increase your chances of getting sick. Cold air causes vasoconstriction, or the narrowing of blood vessels, in your nose and airways, leading to dryness. The mucus in your nose helps prevent infections, so when it is dried out, your body has one less defense against viruses and bacteria. Indoor heating also dries out the air, which in turn can dry out your nasal passageways and increase your risk of illness. By taking a few precautions, you can safely run outside, even if the weather is "frightful." Layering your clothing properly is the key to staying warm and dry on a winter run. Your innermost layer should be a fast-drying, synthetic fabric. A fleece jacket or shirt will hold in your warmth and a wind-resistant or, better yet, waterproof outer shell will keep the wind and precipitation from affecting you. 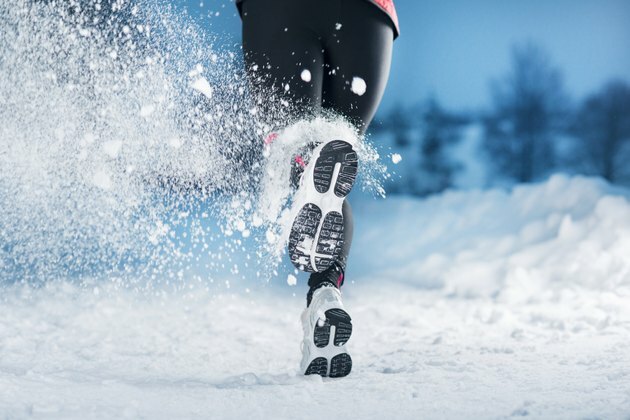 Wear a hat, gloves and warm socks, and think about investing in waterproof running shoes for combating slushy streets. Run into the wind on your way out, placing it at your back on your return home to avoid windchill. On a run, keep moving; hypothermia can set in quickly, especially on a windy day. Hypothermia lowers your immunity and can provide a window of opportunity for germs. Take a cell phone with you, or tell someone your route and estimated duration in case you slip on ice or become chilled. Once back home, wash your hands frequently and keep communal surfaces disinfected. You can use a saline nasal spray to keep mucus linings moist, as well as a humidifier to add moisture to the air, but use distilled water and change it every day to avoid bacteria buildup. Contact your physician if you have symptoms of a cold or flu.